I got my GReddy E-Manage installed today at N1 Racing in Sunway. I managed to get the last unit. I was actually aiming for the second hand unit but someone had bought it already. So I got a brand new one. They had an installation and tuning package bundled together with the E-Manage unit for a total of RM1500. Got a fuel pressure regulator too for RM70. 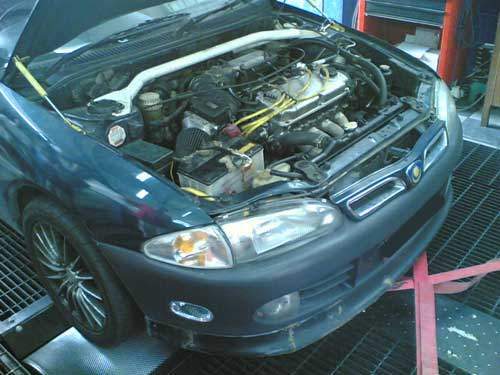 There was already a Proton Waja on the dyno so I had to wait till it was finished before my car could go on the dyno to tune the E-Manage. 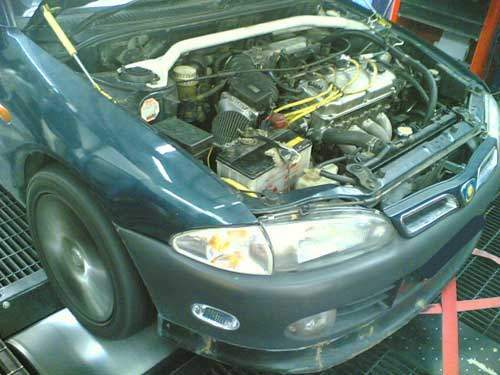 The Proton Waja was nicely kitted up and it had a 4G93T GSR in there with a custom turbo controlled by a standalone Haltech ECU. Expensive stuff. My bumper’s still unpainted from the accident. It’s been almost half a year. I’m still deciding whether to repaint the car or not so it’s going to stay this way for quite some time. I’m kind of growing onto the green which I originally felt lukewarm about. 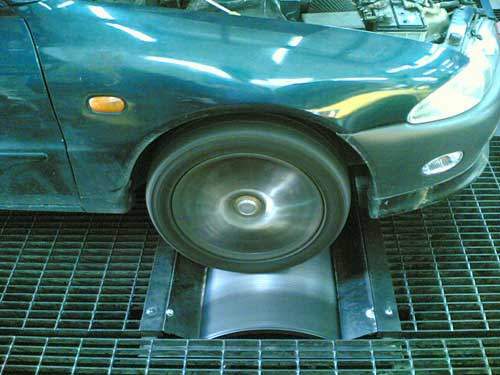 Since my car is front-wheel driven, the front wheels are placed on the dyno rollers. 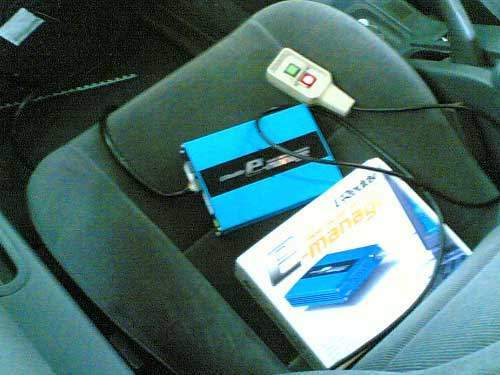 The tuner gets into the car and shifts the car into gear. The car doesn’t move as it’s strapped down, but the wheels spin the dyno rollers. These rollers measure torque and horsepower over different RPMs. 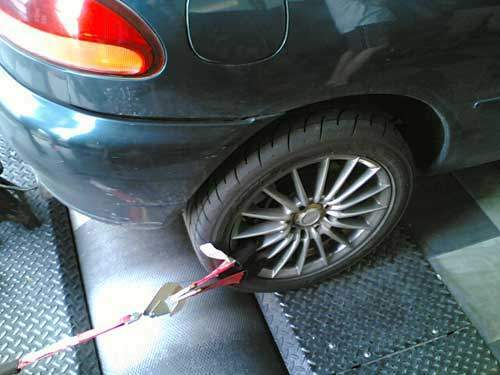 Notice in the first picture of this blog post, the front of my car is hooked up to a harness to keep it on position. The same straps tied to my rear rims. 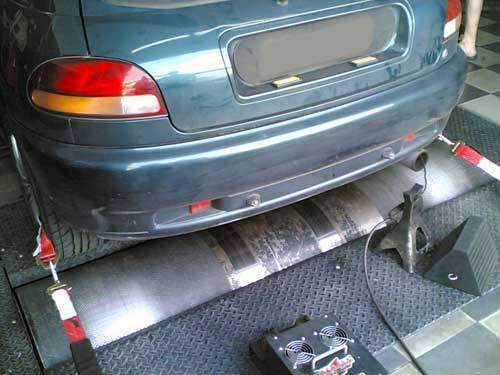 To prevent the car from moving forward of course! If you notice, there are rollers near the rear wheel too. 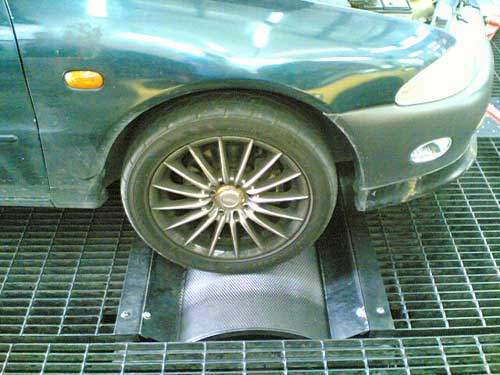 These are not used during my dyno tune, but if you have a four wheel drive vehicle like a Mitsubishi Lancer Evolution this dyno machine can measure power at wheels for all four wheels. The front rollers can move backward and forward to adjust to the wheelbase of the car being dynoed. The wire sticking into my exhaust pipe is connected to a Wideband O2 sensor. It’s that thing with the two fans. 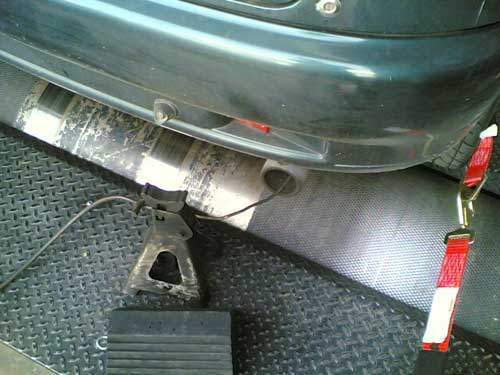 This measures the air-fuel ratio by detecting oxygen in the exhaust stream. 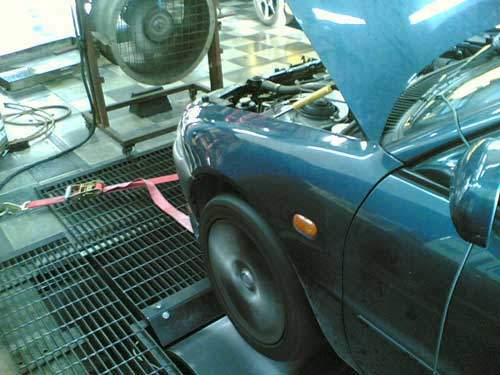 We need the air-fuel ratio readings to tune the GReddy E-Manage. 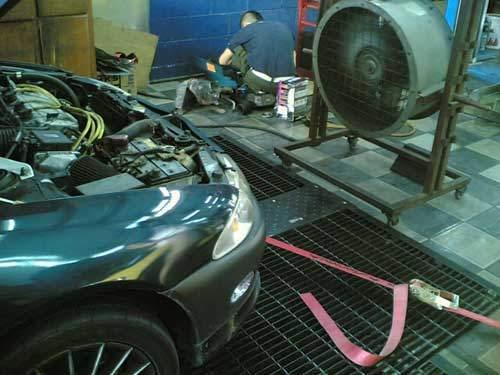 This high-powered fan simulates the actual road condition of wind blowing into the engine bay. Here’s the car being dynoed. 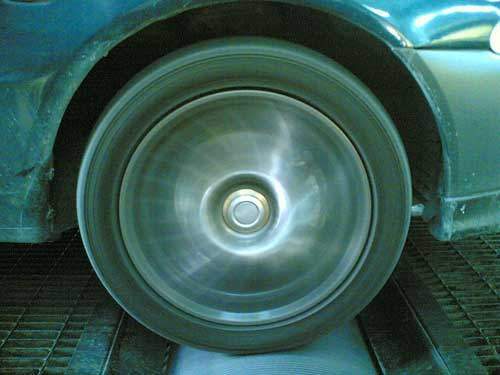 I’ve always wanted to see how my wheels look like when they’re spinning. That’s not something a driver can do while driving the car. 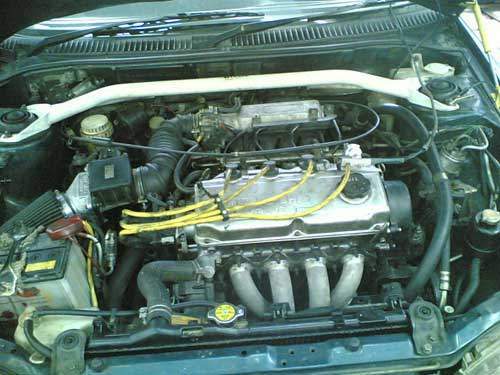 This is the GReddy E-Manage piggy-back engine management unit. It allows 16×16 rpm air-fuel ratio tuning points. It can also adjust the VTEC engagement points if your engine has such features. There is no screen unlike the APEXi S-AFC2 so it’s a little less cool, but it makes up for that with more features. The GReddy E-Manage has 5 controls for you to control 5 of the RPM points by yourself. But to access all the other features, you need a computer with the E-manage tuning software which costs more. After the tuning, there was a rough 10% improvement in horsepower. I still have to do some work on the engine before it can release it’s true potential, which is not much, but the tweak freak in me is dying to get it out. Next Post: Proton to re-visit Mitsubishi partnership?